Just a quick one today for another community review on r/WorldWhisky. 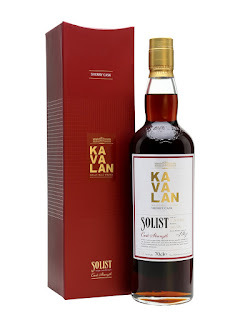 Kavalan is the cult Taiwanese distillery, but I've never been really impressed by their stuff. I tried the Fino Sherry recently and didn't like it at all and that's meant to be the top of the solist range, actually I liked the Concertmaster better. Anyway, the solist's are from single casks/barrels and at cask strength. The 2 numbers after the S are the year distilled, so gives you an idea of the age. These are my notes from 2 different batches I've tasted. Nose: Rich, very intense Sherry. An intense marzipan note with cake, some rich exotic spice- Cinnamon, nutmeg, a touch of coriander, intense clove, oak integrated with the spice. Stewed tea, big Oloroso Sherry everywhere. Very sweet but the fruit is in the background- Raisin, date, fig, more plum, stewed rhubarb with brown sugar (think crumble). Mulled wine and intense red grape. Water: A little less intense but it loses something, more leathery, tobacco, a bit rubbery, more feinty, settles down a bit but not a lot. Taste: Huge, intense, very sweet, lots of Sherry then the alcohol coming in with a cooling note, the sweetness then returns gradually with brown sugar, plum, date, clove, lots of spice and oak, then a little creaminess and finally going dry with a LOT of tannins into the finish. Water: A lot more creamy arrival, to the point of watery, then quite a lot of Balsamic vinegar and rubbery oak which goes into the finish too. Tobacco and leather too. Finish: Long length. Sweet and drying, oaky spices with a lot of dry tannins. Without water this had a great nose but it fell apart a bit when diluted. Nose: Intense Sherry and raisin, coffee beans, stewed fruit, aromatic wood spice. Taste: Intense, very sweet, stewed fruit, coffee, biscuit, syrup, honey, warm aromatic spices building. Finish: Medium length. Fruit fades leaving spice and some oak. Think this one is meant to be one of the better batches but still didn't blow me away.